Hearing (or audition) is the ability to perceive sound by detecting vibrations through an organ such as the ear. It is one of the traditional five senses. The inability to hear is called deafness. In humans and other vertebrates, hearing is performed primarily by the auditory system: vibrations are detected by the ear and transduced into nerve impulses that are perceived by the brain (primarily in the temporal lobe). Alcmaeon was, says [J.] Wachtler, the first who attempted to explain the phenomenon of sound and our perception of it by reference to the structure of the ear itself. Empedocles to some extent follows or agrees with him. 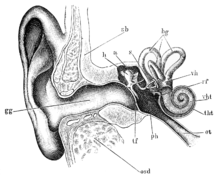 ...Empedocles teaches that hearing is caused by the impact of the air-wave against the cartilage which is suspended within the ear, oscillating as it is struck, like a gong. Lord Byron, Don Juan (1818-24), Canto XIV, Stanza 37. Your people are talking together about you by the walls and at the doors of the houses, saying to each other, ‘Come and hear the message that has come from the Lord.’ My people come to you, as they usually do, and sit before you to hear your words, but they do not put them into practice. Their mouths speak of love, but their hearts are greedy for unjust gain. Indeed, to them you are nothing more than one who sings love songs with a beautiful voice and plays an instrument well, for they hear your words but do not put them into practice. John Milton, Il Penseroso (1631), line 120. John Milton, Comus (1637), line 560. William Shakespeare, Julius Cæsar (1599), Act II, scene 1, line 318. William Shakespeare, Julius Cæsar (1599), Act III, scene 2, line 13. William Shakespeare, Julius Cæsar (1599), Act III, scene 2, line 78. Quotes reported in Hoyt's New Cyclopedia Of Practical Quotations (1922), p. 357. Geoffrey Chaucer, Canterbury Tales, Book IV, line 435. Muse, that presides o'er all the Powers of Sound. Abraham Coles, Man, the Microcosm; and the Cosmos, p. 51. Matthew Henry, Commentaries, Psalm LVIII. John Heywood, Proverbs, Part II, Chapter IX. John Keats, Addressed to Haydon, Sonnet X. God spoke and it came out to hear. George MacDonald, Song, At the Back of the North Wind, Chapter XXXIII. As a matter they had no concern in. Jonathan Swift, Dingley and Brent. William Makepeace Thackeray, Virginians, Chapter XXXII. Themistocles, Rollin's Ancient History, Book VI, Chapter II, Section VIII. This page was last edited on 2 October 2018, at 21:46.